Last week, [David Shorey] came along to the monthly Hackaday meetup in Pasadena. These meetups feature speakers and drinks, projects and chit-chat, and sometimes a few demos of what the local Hackaday community has been working on. [David]’s impromptu demo was something no one had ever seen before. It’s 3D printed tiles embedded in fabric. This is the beginning of 3D printed flexible armor, a great method for cosplay builds, and a really cool way to add another trick to your 3D printing toolkit. The steps to reproduce this project are actually very easy. The most important bit is the fabric itself. This is just a piece of tulle, a fine fabric mesh that’s usually used for bridal veils. According to members of the 3D printing community, you can pick up some tulle in the fabric department of any WalMart. The steps to reproduce this technique are simply to print three layers, pause the print and move the head out of the way, lay the tulle down on the print, and hit resume. 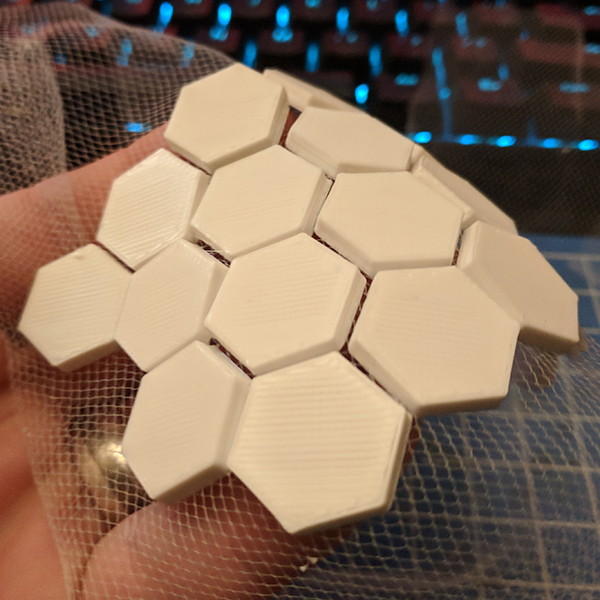 Judging from the commentary surrounding this new technique, there are a few tips and tricks to get the most out of this 3D printable fabric. The fabric should be taut and held down with either tape or binder clips. Melting or burning doesn’t seem to be an issue, but tulle made out of nylon is fairly common, and printing 3D panels with exotic filaments that require high temperatures may result in a mess. While very cool, there are some limitations to the technique. If, for example, you are building a suit of body armor out of bendable tessallatable panels, you will have to assemble a quilt made out of panels as large as your print bed. This could be made easier by sewing (or gluing) the tulle/scale assembly onto a larger piece of fabric. Alternatively, the process could be modified for use with an Infinite Build Volume printer. This would give you yards and yards of 3D printed scales, ready to be fashioned into an outfit. This is one of the most interesting techniques to bring 3D printing into the domain of ‘soft’ hacks and fashion we’ve ever seen. If you want to check out what’s possible with this, be sure to follow [David] on Twitter and out his Instagram. There are a lot of really great ideas there. As with most ideas in 3D printing, this is one that’s been done before, albeit at not such a high level. [Drato] a.k.a. [RobotMama] did pretty much the same thing a few months ago, and we thank her for her contribution to the community. I think you’ve just invented green plastic army men! But how do you make the SPH? Why not just print a front and a back to each piece with a few pegs in one side and a few holes in the other then just press them together over the fabric at the end? Could have overlapping plates that way. And if you had a couple of layers of something like silk between the layers it would allow easier movement. I wonder if a spacesuit could be built using that method. It’d be thicker, pinch the mesh and require a gluing with something compatible to both materials. And it would arguably be more work, since you’d have to assemble and position every panel. But it might be a nice method for joining multiple sheets with a seam of special two-piece panels. Does anyone use a 3D printer to integrate sensors in fabric? Maybe can even spray coat the above article printed items to study electromagnetic effect. Stealth antennas maybe? Adafruit has demonstrated the flexible resistance and heating fabrics recently in adds. Wondering what kind of bio-feedback systems can be made also including the re-enactment or whatever the different costume groups are called. Next thing you know people will be 3D printing bathroom tile! Seems I’ve read somewhere, someone is 3D printing pottery or ceramics. Can’t be that complicated as may need an auger type driver. What was the compressed air system now that I think about it more??? Seems that was on hackaday or I watched on youtube. Print out the real body armor tiles and fire in a kiln. Then have a 3D printed system to install the tiles? HHhmmm… seems a sewn kevlar fabric system is more efficient… though… maybe something printed is easier for binding the ceramic part. Another problem is this approach keeps the same topology as flat fabric. It can work for sleeves but not shoulders for example. Any truly concave/convex surface is going to require something different like the snap-on systems people have discussed above. I wonder if it’s possible to use an auto leveling system to print on a considerably curved surface, like a tailor’s mannequin. Might be a job for a 3d scanner and a robot arm type printer. Given that leveling tends to be done by modifying the path to be level with the bed there’s no actual reason someone couldn’t effectively build a custom slicer that did non-flat slices. It would certainly be easier to stretch lacy fabric than plastic plates. Alternatively I guess you print the underside normally with removable supports for the arch of the curve. Then you convince the system to print an object with a curved underside with no supports once you have the mesh down. Any printer with a decent auto-level (officially referred to as tramming) can print on an angled surface to a degree, but an actual curve would require adding a new axis of movement. The hotend/nozzle would need some yaw capability to keep it pointed at the “bed”. The mesh levelling can print on curves. wonder how well this would work on kevlar fabric. frag that, just use screen print/ stencil to apply epoxy “tiles” right on to the fabric, you can even reinforce the epoxy with carbon and or fine abrasive powder. the epoxy will bond with the fibers and your rip the whole thing before the tiles come off. Carbon fibers would probably be a better choice, as not only are they stronger, but also don’t care about water, unlike virtually all aramid-based fibers. Nylon can be printed… though I wonder for skid purposes if the optimal formula is available. May be a market op?